Quick, what's the nation's largest urban forest? Add our 700,000 street trees and our 800,000 trees in parks to the 20 million trees on private property in our city, and the answer pretty quickly adds up to be L.A. That forest canopy forms a vital part of our city’s infrastructure, reducing “heat island” effects, preserving ecological balance, cleaning the air and providing oxygen, helping control floods and conserving water and energy, not to mention raising property values and generally making the difference between L.A. as a beautiful city and L.A. as a paved-paradise caricature of itself. Of course, you don't need me to tell you that A Tree Grows In Los Angeles—you want to know what the City Council is going to do to protect them. Our newly revised and revitalized Protected Tree Ordinance regulates the removal of oak, walnut, bay and sycamore tree species. (The original 1980 ordinance only regulated oak trees.) Property owners can still remove trees, but they must seek a permit for trees over a four-inch trunk width. And there are penalties for developers who ignore or flout the process. The new ordinance was put together with over a year of input from stakeholders and arborists. Special shoutouts go to Clare Marter Kenyon, the chair of the Community Forest Advisory Committee, and to Molly Rysman from my staff. Thank you both, and thanks to everyone in the departments who worked on this policy including L.A.'s own Chief Forester George Gonzalez, for working on policy that will help protect our urban environment. A comprehensive list of the street closures that will be in effect for the Academy Awards, complete with maps and schedules, can be found here. Early in the morning of August 16th, 2001, a fire was set in the derelict Palomar Hotel on Santa Monica Boulevard near Western Avenue by the hotel owner, who wanted to collect insurance and avoid expensive repairs. The owners’s brother died helping him set the fire. Also killed was Norma Galindo, who fell to her death only moments after handing her two young children, Lupita and Miguelito, to LAFD firefighters Bob McMaster and Tony Cardona. I remember that morning clearly, almost five years ago, grappling with the tragedy and trying to ease the suffering of the survivors. Today I returned to the consecrated ground there to see what had risen from it. Built by the Hollywood Community Housing Corporation with assistance from the CRA/LA and TCAC bonds, the 27 apartments in the restored Palomar Apartments will serve low-income senior citizens and people with disabilities. 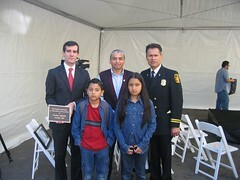 I invited Miguel Angel Galindo and his two children to the grand opening ceremony, where we dedicated the building to Norma. We were also joined by Assemblymembers Jackie Goldberg and Dario Frommer, by the firefighters who fought that fire, and by representatives from the agencies who worked on the project. Four and a half years ago, I was inspired by the community’s reponse to the victims of the fire. Volunteers in East Hollywood helped the Palomar residents find beds at the Lemon Grove Recreation Center, and local churches donated food. Donations to help resettle the torn Galindo family came in. The Little Red Schoolhouse offered Lupita and Miguel free tuition for elementary and middle school. Our better angels came out at the moment our neighbors needed them. We honor that spirit by dedicating ourselves to continue to find solutions—locations and funding—to the housing crisis in our city. Norma Galindo’s spirit is honored by the homes and the community that rise here from the ashes. Who's riding the Holly Trolley? Jillian Tate at (the very nicely redesigned) blogging.la files a report on riding the Holly Trolley this weekend. See the comments for tips on how to get free tokens and the most courteous "ambience directors". And one more tip: Jillian was able to get a $2 validation at Hollywood and Highland, but if you plan to be out for longer than the validation period, you can ask on board the Trolleys for a validation stamp and pay $6 for the whole night at either the Hollywood & Highland or Arclight Cinerama Dome garages. Retrievr allows you to search images by your own drawing. Draw in the box and it looks for photos in flickr that look like your sketch. Shawn O'Connor is a senior at Hollywood High School, home of the Sheiks, where he has lettered in varsity football for three years. Last year, with help from with my brother-in-Hollywood Councilmember Tom LaBonge, my office found the funds to light up Hollywood High School's gridiron for the first ever night game in its history. The performances of Shawn O'Connor and his team that night, under the lights with the bleachers packed, were nothing short of spectacular. With just sixteen seconds left to play and Polytechnic up 28-21, the Sheiks scored a touchdown and pulled off a two point conversion, with Shawn blocking, to win by the smallest margin possible, 29-28. They didn't just win the game: they broke a more-than-twenty-game league losing streak. And they kept it broken. Hollywood has known the pain of a bad losing streak. There was a time when it seemed like we'd been down so long we didn't know what up was. But lately we've known grace, and we've known triumph. And now it's our night game. The lights are on and the stakes are high. I've tried to tell the stories of people who point the way forward for us as a city. Whether a homeowner who takes back her neighborhood, a business that sets up shop on a geographical edge, a cook who makes it to the top and another one that comes back from the bottom, or a homeless man who finds the help he needs to turn his life back around, each has found success by drawing on the people and opportunities around them, each have created a vital part of our growing city, and none has done it alone. Writ large, each provides the lessons we need to take from the last few years about reclaiming our neighborhoods, nurturing our businesses, and planning our city. The smart growth and strong community that has developed in the thirteenth council district, an urban, diverse, struggling and thriving slice of Los Angeles, shows the way forward for the whole city. The subject of my last story didn't join me for my address to the Chamber, but I think her tale embodies the luck, ambition, dreams and drive that Los Angeles needs (and very much has). In 1988, a young film student at the University of Texas visited Hollywood on spring break. She and her friends used up two whole rolls of film snapping pictures of stars along the Walk of Fame. She swore that one day she would be a part, however small, of the magic of Hollywood. Last May, Renee Zellweger returned to the Walk of Fame not to photograph the stars but to join them. As she laid her own plaque down amid the galaxy-in-terrazzo along Hollywood Boulevard, she recounted how she’d "crossed her fingers" that she would come back, but she "never, ever imagined a day like this." I remember walking on Hollywood Boulevard with my own dream, five years ago, on my way to a candidates' debate. To represent the thirteenth district on the Los Angeles City Council seemed just as far out of my grasp that day. Robert Kennedy one said that "the future may be beyond our vision, but it is not beyond our control." We can never let our successes blind us—we've got too much left to do. Too many children to protect, too many homeless to house, too many parks to build, too many jobs to grow, too much gridlock to unlock, too many schools to build. But we know in our heart that that glimpse of the future is more hopeful now that it has ever been. LAist has an interview up with Joel John Roberts, the executive director of People Assisting the Homeless, where Richard Cruz stayed for several weeks. Richard Cruz came to Los Angeles in pursuit of the Hollywood dream, but all too quickly it turned into a nightmare. Drawn by a job offer from Miramax, Richard arrived to find it had fallen through. When his savings ran out he moved in with an acquaintance in Van Nuys, but knew he had to leave when he caught one of his roommates stealing his possessions to buy crystal meth. Richard could be any of us. He could be me; we lived in England at the same time in the 1990's, me as a student, he as a theater designer. Bad luck and bad timing left him stranded in a new city with few options. He found himself half-sleeping behind a bathhouse off Victory Boulevard, and wandering the streets in search of a private hedge to rest behind by day. With no job prospects, nowhere to live, and nobody to rely on, Richard felt alone and invisible, when he didn't feel loathed. People Assisting the Homeless (PATH) in East Hollywood changed all that. PATH took him in, gave him a room with a lock on the door and a bed, and provided him with a haircut. During his 5-week stay there he relentlessly he pounded the pavement and pored over websites until he finally found a job, working security for the nightclub then called Deep at the corner of Hollywood and Vine. He put together enough savings to move out of PATH and get a room at an SRO hotel at 3rd and Main. He did event planning part-time with a company called Portal Productions. Now he's doing okay, but he is still in search of a better room, a car that runs, and steadier work. He's still looking for home. Just as Richard is relentless in his pursuit of a better life here, so we are relentlessly at work to help him achieve it. I've blogged before about PATH director Joel Roberts' Project YIMBY. You've heard of NIMBYs; well, a YIMBY says "yes in my backyard." A church full of YIMBYs pushed me to support the Community Redevelopment Agency's construction of a permanent housing facility at Hollywood and Gower, which will take people off the streets for good. Three years ago, the Hollywood Interfaith Sponsoring Committee challenged me to alleviate the housing crisis by building 500 units of affordable housing in Hollywood. Today, three hundred of those units are built, with three hundred more on the way. At the corner of Sunset and Western, we opened the first (though by no means last) project to be completed with our city's $100 million affordable housing trust fund, which is the largest in the nation. And you already know how I feel about the proposed $1 billion affordable housing bond, which would provide us with even more resources to give Angelenos the kind of homes they deserve. These and other creative, yet common sense, solutions to homelessness are at our disposal, and we are steadily implementing them. The fight can appear overwhelming on its face, but you need only hear the story of Richard Cruz to know the story of thousands more—and to know how vital it is for us to do what it takes to end each of those people's stories in his or her own home. Early this year, at Richard Heyman's new Southern-style restaurant Memphis, I met Francisco Chaidez, the executive chef of Memphis, and his executive sous-chef, Terry Fortia. Francisco Chaidez couldn't have had a more Hollywood story. As if following the path from the William Morris mail room to the director's chair, Francisco had started as a dishwasher at Tribeca of Beverly Hills. In a path that took him to Utah and back to Southern California, he rose to become the executive chef at Memphis. I knew I had seen Terry before. I just hadn't known it until I met him again at the restaurant. In the days after Hurricane Katrina, when New Orleans residents were fleeing the rising waters to those distant towns that would take them in, Terry and his family found themselves at the Dream Center, a church-run community center in CD13. Terry had been the chef at the New Orleans Yacht Club, wiped out in the storm. Now he was far from home. But his luck turned back around. A good Samaritan gave him the keys and the pink slip to her car, a Dodge Caravan that would fit his family of nine. The media sniffed out the story of a castaway chef, telling the story of New Orleans through its gumbo-in-exile. And a Hollywood restaurateur who was opening a Southern restaurant watched the news and wasted no time in driving to the Dream Center and offering Terry a job. Terry Fortia's welcome showed Hollywood at its best: compassion, generosity, and opportunity all at once. People like Terry, who come here through will or chance ready to take their best shot, are to Hollywood what the spices are in one of his creations. He reminds us that we are a city of perpetual newcomers in a nation of immigrants, and stronger for it. Not to mention he makes some mean fried chicken and baby back ribs. Jeff Miller is a line producer at the production company Smuggler , one of the newest members of Hollywood's revitalized artistic community. Smuggler, which has been named Creative Magazine's "Production Company of the Year," had been sharing space with another production company in Beverly Hills when the time came time to find its own roof. As Jeff describes it, the company wanted a location that would cater to agencies' and clients' desires. When they found a site at Hollywood and Gower, at the eastern edge of possibility for them, they knew they'd come home. They sandblasted the interior and hung chandeliers of Austrian crystal that can be seen from the street. Now they operate around the clock, in a building that houses 9 permanent employees but with shoots and projects bulges to fifty. Their selection has other agencies seeking to follow them. Jeff says that it's "set a new tone within the industry's perception of location as status." Laura Thoel, the head of production at Smuggler, put it even more succinctly when she said, "I wouldn't work anywhere but Hollywood." That sentiment is more and more common in the entertainment industry now. Like never before in recent memory, the creation of entertainment takes place in Hollywood the neighborhood on a day-to-day level. 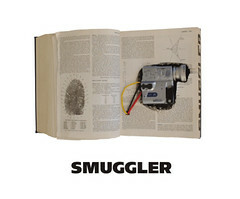 Smuggler is just one of the many entertainment companies and professionals who are finding out that, perhaps now more than ever, Hollywood is the place to be. The first person I'd like to spotlight is Maripat Donovan. Maripat, an actress and writer, moved from her native Chicago to Los Angeles in 1999 with her acclaimed one-woman show, "Late Night Catechism". At first thinking she would live in the San Fernando Valley, she instead fell in love with a beaten-down craftsman on Harold Way, not far from the intersection of Hollywood and Vine. She restored the house on Harold Way. But that wasn't enough for Maripat. She may have come to Los Angeles in a one-woman show, but she soon found herself in a one-woman redevelopment agency. With investment, an enormous amount of elbow grease, and the application of skills that she never expected to use outside of set design, she went on to transform a small neighborhood—attacking trash, adding greenery, and uniting her neighbors in service to their community. Maripat helped form the Hollywood Studio District Neighborhood Council, where she joins other neighborhood heroes working every day to improve quality-of-life at a neighborhood level. Yard by yard, building by building, block by block, she and hundreds like her combat the problems that need combating, and help reclaim the community from the forces that undermine it. Maripat's story means more one person's extraordinary accomplishment in one neighborhood. It shows us that the most daunting tasks can be accomplished when dedicated people pull together and decide to make that difference. The Maripat Donovans of the world challenge us to do more, and they assure us that we can.